Laguna Beach, CA (USA) -- Just days after he made a guest appearance on national television on Comedy Central's "Colbert Report," the same unassuming man showed up in the office of a friend, Laguna Beach physician Robin Eckert. << Staff photo by Faye Chapman Lama Surya Das, the popular American Buddhist lama, strikes a meditative pose while visiting the Laguna Beach office of a friend. The polo shirt-clad guy in the waiting room was not a political pundit or a Hollywood celebrity but an American Buddhist lama, Lama Surya Das. For many unfamiliar with its modern practices, Buddhism summons an image of the Dalai Lama and men in robes. By appearance, Surya Das looks like a regular guy. When told that some local Buddhists frequent the dog park, this reporter gave the knee-jerk response, "Oh really, I haven't seen any." My interlocutor wondered what I expected to "see." What Buddhists looks like isn't the only common misperception. Surya Das says he routinely strives to dispel perceptions that Buddhism is "foreign" and that it's hard to meditate. "I'm a three-sport jock from Long Island," said Surya Das, who was born Jeffrey Miller to Jewish parents. "My message is that if I can do this enlightenment thing, anyone can." His Laguna connection comes via Roger Walsh, a professor of psychiatry at UC Irvine and part of a group of physicians interested in the healing powers of contemplative practices. 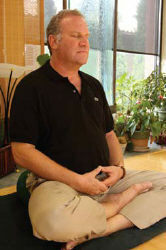 He studied meditation with Surya Das, whom he describes as an "accomplished meditation teacher." The two men sometimes lecture together. Through Walsh, Surya Das met Eckert, who also teaches at UC Irvine and who maintains a Laguna Beach medical practice specializing in integrative medicine. Eckert diagnosed and cured a sleep disorder that had been plaguing the American lama. "I'm a big fan of the Laguna health and healing plan," said Surya Das. "Robin is really a genius." Surya Das is usually in California about once a month for lectures and meditation workshops and a stop in Laguna Beach is de rigueur. He isn't without company. "A lot of people think Buddhism is like a religion, but it's more a way of life," said Laguna resident and Buddhist Walt Winfield, who besides meditating on his own practices Vietnamese Kigong, a form of moving meditation, every Sunday in Heisler Park for the past 15 years. The house painter and part time overseas tour guide is unaffiliated with any particular Buddhist group and calls himself an "Internet Buddhist," finding a lot of good information at the site www.justbegood.net. There are countless Buddhist sects that seem to share a basic mantra: they want to be happy, they want others to be happy and they ultimately strive for world peace. The practice involves meditation and/or chanting to expand one's capacity to achieve happiness through an inner transformation, finding one's "inner Buddha." Laguna Beach resident Jason Wineinger, a cellist, has been practicing Nichiren Buddhism for 40 years and holds regular meetings in his North Laguna home. Nichiren Buddhism, which involves chanting, is sometimes referred to as the people's Buddhism because it stresses accessibility and deemphasizes clerical authority. About 17 men and women attended a recent meeting, and their explanations about why they began following this teaching and stayed with it were extremely similar. They were searching for happiness and for a way to have a positive impact on the direction of their lives in their daily struggles. Group member Liz Goldner's experience is representative. She said she was inspired because, "[Buddhists] that I met had a sense of calmness and compassion that I was unfamiliar with. They had a solid quality within themselves that I didn't see very often and that I really liked." Nichiren Buddhism involves regular chanting, which Goldner admits takes some discipline. But it is worth it. "I have more insight, I'm more self-reflective, and I have the ability to cope better with everything that's in my environment," she said. Surya Das, with 28 or so years of training in Tibetan Buddhism, also emphasizes equality and insists that despite his training he is "no different" than anyone else. He believes in Buddhism as a positive means for people in every walk of life to improve their lives and the lives of those around them. "We need to lighten up as well as enlighten up," he said. After graduating from college in the early 1970s, Surya Das traveled throughout Europe and the Asia. He became a Buddhist monk and then trained extensively as a lama before returning to the United States. In the early '90s, he began lecturing, teaching meditation and giving motivational talks and hasn't stopped. In 1993 he founded the Dzogchen Center in Cambridge, Mass., where he lives. He's also published a number of books, including the bestseller "Awakening the Buddha Within," (Broadway Books, 1997) and his most recent, "Words of Wisdom" (Koa Books, 2008). In the meantime, he is seriously considering Laguna as the location for a second home and possibly retirement. Whether or not this comes to pass depends, of course, on karma. For more information about Lama Surya Das, visit www. surya.org or www.dzogchen. org.